Good morning! I used Julee's latest sketch, Mojo #107, for my Autumn Wishes card. I finally had a chance to play with some of my new Verve. I used Harvest Blessings. I stamped the fall wreath once in Ripe Avocado, then once again in black. After I colored the flowers, I cut each of the black inked ones out and popped them on top to complete the wreath. I hope you're having a wonderful week! Thanks so much for stopping by! Accessories: Circle and Scalloped Circle Nestabilities (Spellbinders), Markers (Copic), Pearls (Kaisercraft), Scalloped Grosgrain, Grosgrain (May Arts); Foam tape. 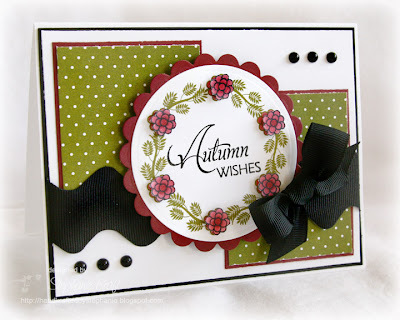 stunning, Love the colour combo, and the green dotty paper, and that black ribbon is amazing!! Such a lovely card. I love your wreath. this is lovely!! Love the extra detail of the flowers you did!! Fabulous mojo card!! Love the black - really makes things pop.